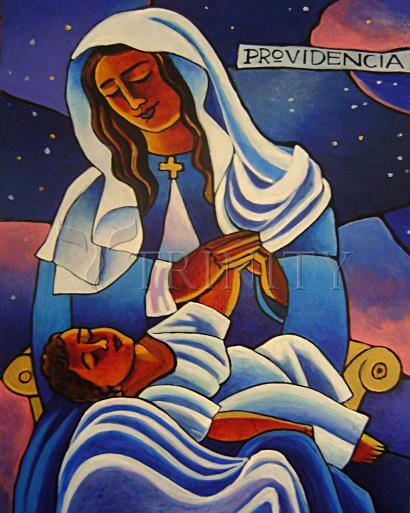 This image of Our Lady is special to the people of Puerto Rico. Nuestra Senora de la Divina Providencia, pray for us! While in Rome, Monsignor Rawlinson obtained from the Barnabites the history and the original documents and literature of the devotion to Our Lady of Providence. Enriched with these credentials, he returned to Saint Mary-of-the-Woods. There, at his request, the Rt. Rev. Bishop Chartrand, D.D., erected the Confraternity of Our Lady of Providence. The devotion rapidly made its appeal. Gaetano's lovely Madonna gazing lovingly upon her two-year-old Son, has so won the hearts of American mothers that, by popular assent, Our Lady of Providence was lovingly addressed "Queen of the Home." Her image was enshrined over the fireplace of thousands of homes throughout the land. And out of sheer love for Our Lady, teachers, through the medium of instruction, song, and program inspire their pupils to carry to their homes the message of this "new-old" devotion. Whole parishes have been enrolled in the Confraternity.